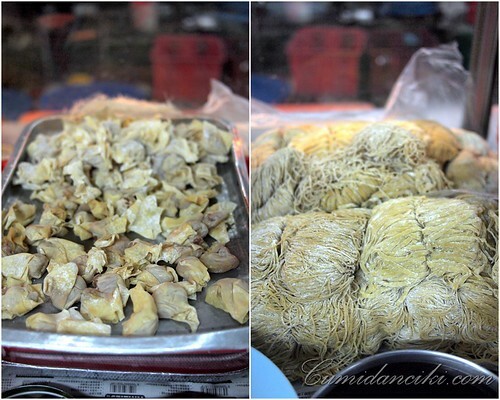 It wasn’t long after our late night dinner at that Indonesian Warung, that we decided to go back to Pudu Wet Market one night, to check out this wantan mee stall we saw the last time we were in that part of the neighbourhood. We were early and the cooks were just starting to prep the food. Great.. more photography opportunities for us! This part of town never ceases to amaze me. 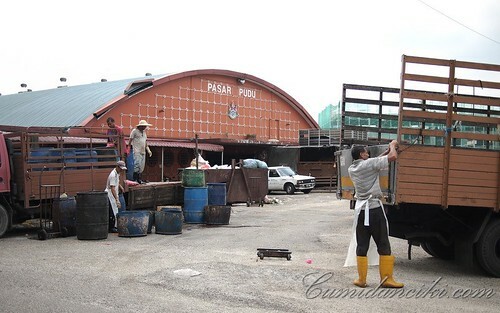 Pudu houses the city’s biggest wet and dry market to date – Pudu Market is a crowded market place especially in the early morning where there are plenty of stalls and makeshift carts containing merchandise from live chickens to different kinds of fruits. The sellers of Pudu Market are super-friendly and bargaining is allowed. You can actually bargain and lower the price of all your purchases before giving in to the merchants. 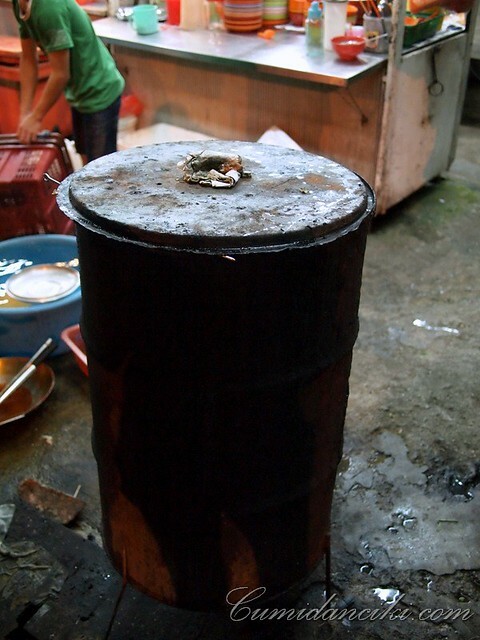 You need to have a strong stomach, as the surroundings are not always clean and the smell can be awful in the wet market but you will find almost any food that you desire. Just south of the Golden Triangle shopping district, Pudu Market is highly accessible via LRT and is only a 5 minute of walk from the station. we work hard for the money.. 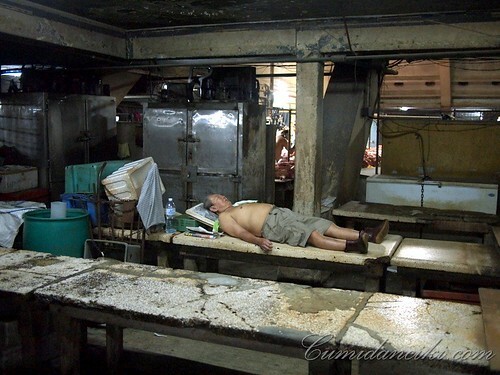 In the evenings, this same area converts into a night-time hawker area and you will spot butchers starting to prep the pig carcasses for the next early morning’s activities in the Pudu Wet Market. 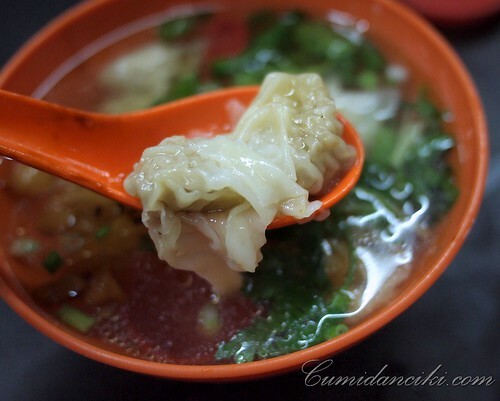 Chinese Bakuteh, Wantan Mee, Indonesian Cuisine, you name it.. they have it. is that a tong sampah (rubbish bin)? 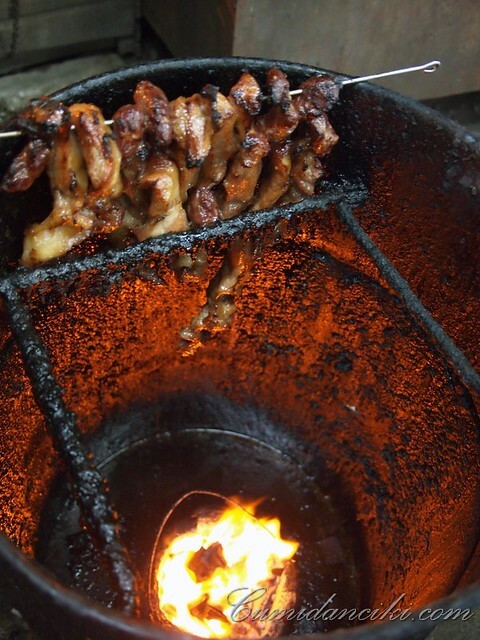 It’s a roasting contraption for for BBQ-ing the charsiew ! Final product looks delicious ! Just next door, butchers are preparing to receive the pig carcass for butchering, to be sold at the next day’s wet market. Some take this window of opportunity to catch up on sleep before the chaos starts once more.. Ever wanted to know the secret behind the super smooth texture of the Hainanese-style Chicken or “pak cham kai” (white boiled chicken) skin? 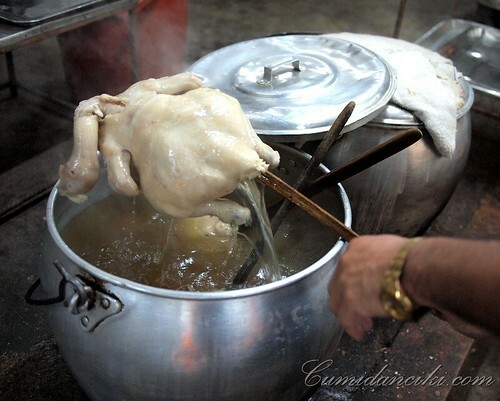 After boiling the chicken, extract with a long chopstick. then, time to go for a bath..
From boiling water, straight into a super ICY COLD bath! Does wonders for the skin. And that, is the secret to the super smooth white chicken skin! The wantan mee Sifu, from the new generation, preps the wantan noodles, and our dinner is on the way. 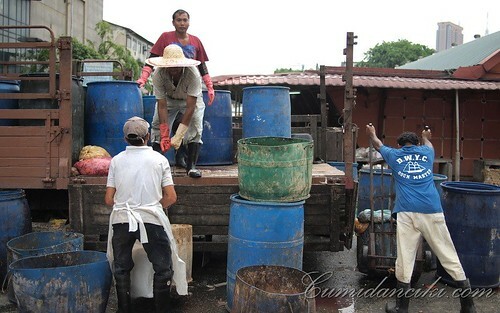 The family has been operating the stall here for over 30 years. Everything is made fresh each evening. Check out the green chilli at this stall – it’s unbelievably fresh and green and crunchy! 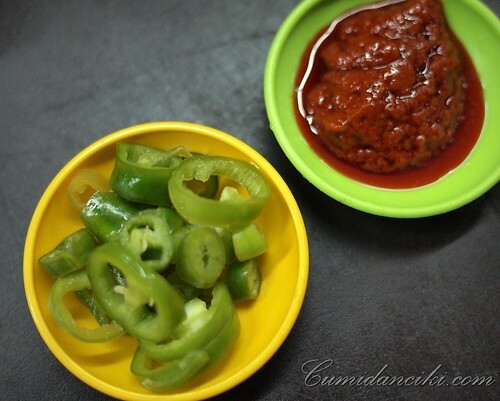 The red chilli made fresh each night, and ours is still hot from the cooking pot. 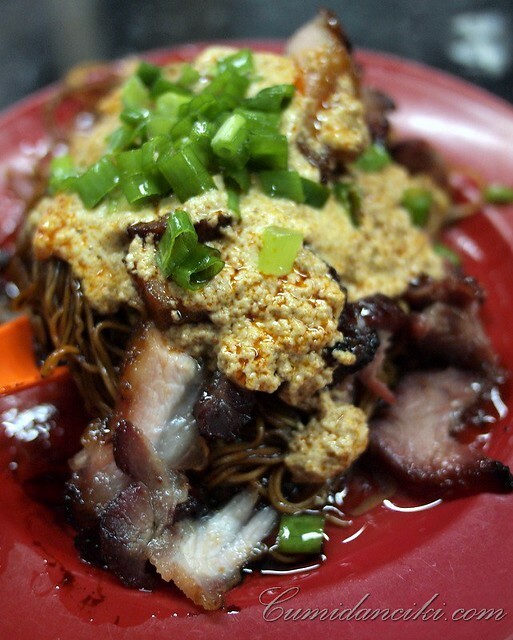 Cumi’s wantan mee – topped with a generous dose of curry sauce and sprinkled with chopped chives and coriander. You can see the thick, semi-coagulated santan (coconut cream) in the curry sauce. 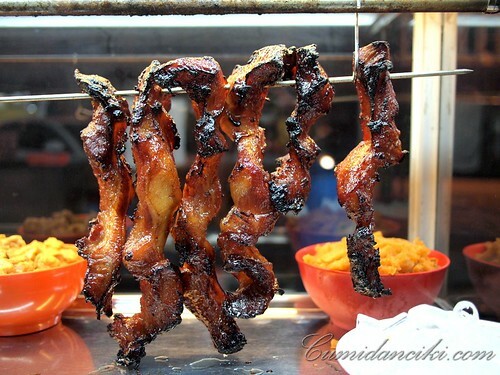 At the base, a layer of pork oil adds even more taste overload. Its a cholesterol redlining dish! The texture of the noodles is al dente. The charsiew is fatty and succulent. The chicken is sweet and smooth – a delightful texture! The ice cold bath really worked! There are generous chunks of fried pork lard in the noodles which I try to avoid. Cumi just mops up the entire lot. 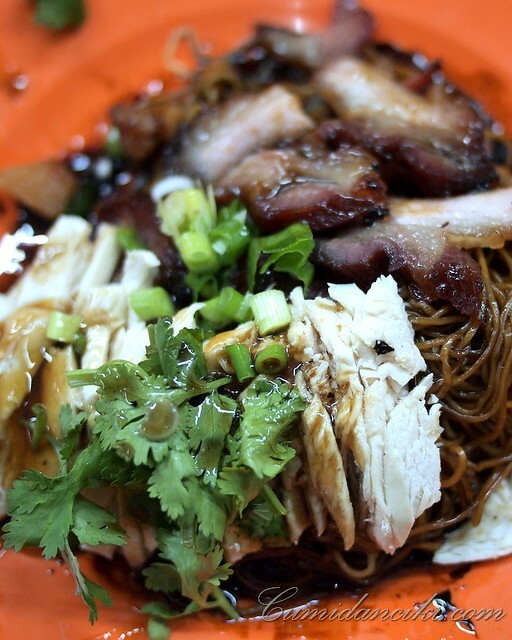 The flavour of the wantan mee is far out! Best I’ve had in ages. Probably best in Pudu too. We keep coming back here for dinner because we can never get enough. They start late – at around 930pm, so if you get there early, you’ll just have to wait patiently till they get their food organized. You cannot rush them.. you just have to sit patiently and wait .. but the Wantan Mee will be worth it! we used to go to this shop to get our CNY supplies i.e. mushrooms, dried scallops, etc at a shop within the Pudu Market area, I don’t know but walking in the dark, you just see rats everywhere and the smell is horrendous..i suppose things must smell a lil better with the sight of wantan mee! Joe I agree.. smells of the wet market are not my thing.. but yeah the hawker food at night is worth the discomfort:P Pudu Wet Market is great – must be the biggest one in KL, and has everything under the sun. Great tip on Pudu market. Was there in the 50’s wt maid to do daily marketing. Took bus from Imbi Road, 10cents fare. Why daily? cause we did not have a fridge back then. My favourite market… LOL. I can almost smell it by looking at your pics. DaMNnnnn …. your photos are amazing. 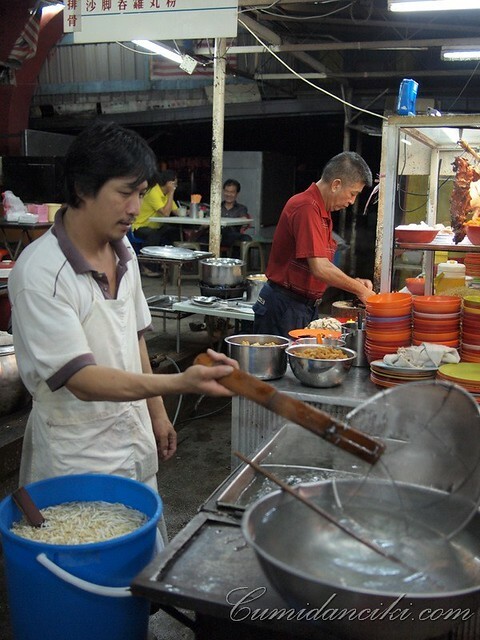 Loved the tong-sampah contraption, and the wan tan mee shots are to die for. I wanna try this place! We love Kafe Indiana in Port Klang, I am not sure if its still opened … but its good. Wah Chai at Bukit Tinggi, Klang is darn good too. I’ll believe it when I read ur post ! haha. Too dirty for you lah Sean! LOL I love your intrepid forays ;D Really enjoyed this post. ahh… i have heard about this stall but never been cos i do not know which stall people were saying. anyway thanks to you, now i know which stall to locate. oh btw, i saw you for the first time at section 17 trattoria restaurant just a few days ago, u look great! Their curry mee is not bad too!